Yannis Adoniou, renowned Greek artist was born in Athens, where he received his first formal dance education. Since 1998 he has been leading the critically acclaimed arts organization, KUNST-STOFF, co-founded with Tomi Paasonen. In 2010 Adoniou founded KUNST-STOFF arts, a studio/art space located in downtown San Francisco, designed to host performing and visual artists from around the globe. Adoniou works in Dance, Film, Opera and takes active roles as a curator, producer, and educator. Beyond his formal training at The State School of Dance and John Neumeier's Hamburg Ballet School, Adoniou’s passion for dance began at an early age at family gatherings and social events. These early memories still drive his curiosity for art-making today. His work challenges and reconsiders the established knowledge and social behavior that we have been taught and speaks to finding one’s personal truth. Adoniou has frequently been in collaboration with nationally known composers, and visual and media artists. His production, “Rebetiko-ρεμπετικο”, on the music of Minos Matsas sung by Catherine Clambaneva, received critical acclaim and toured in the USA and Europe. Adoniou was a principal dancer with Alonzo King’s LINES Ballet from 1993-1998 and a regular guest artist across the USA and Europe. 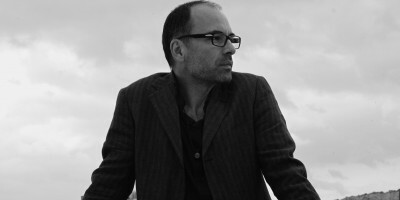 In addition to his work with KUNST-STOFF Dance Company, Adoniou has created works for companies and Universities such as Seattle Opera, Sacramento Ballet, Bonn Ballet,Opera Santa Barbara, the Modern Department at the University of Utah, West Bay Opera, West Edge Opera, and Lines Ballet/Dominican University, among others. Adoniou’s works has been commissioned and presented by Yerba Buena Center for the Arts, ODC Theater, CounterPULSE, Dock11 Berlin, Burning Man, Herbst Dance Festival in Heidelberg, Germany, Dance Forum Monaco, Dimitria International Dance Festival in Thessalonica, Greece, the Athens International Festival, and Ballet Frankfurt, among others. He earned the first place award at Sacramento Ballet’s capital choreographic competition for his creation, “Gomidas Songs”, based on the music of Gomidas Vardabet, and has received support and acknowledgement for his work as a dancer and choreographer from the Isadora Duncan Awards, Irvine Foundation, Dance/USA, 2005 Goldie Awards, San Francisco Arts Commission, MANCC national center for choreography, and the Gerbode Foundation, among others.